That misbegotten PBS show "Walt Disney" has on its website a list of "related books and websites." It's a rather peculiar list that includes only one book by John Canemaker (and that one not directly concerned with Disney) and only one by J.B. Kaufman. My first thought when I skimmed the list was that "authorized" books like Canemaker's Two Guys Named Joe (2010) and Kaufman's South of the Border with Disney (2009) had been excluded because of their Disney affiliation, but that's not the case. The list includes a number of such books, some of them manifestly inferior to excluded Canemaker and Kaufman titles. So who knows what eccentric or peevish principles of selection were at work. I wrote a few years ago, in a review I titled "The Approved Narrative," about the constraints under which the authors of Disney-authorized (and, increasingly, Disney-published) books now operate, and about how a few authors, Canemaker and Kaufman chief among them, have managed to produce estimable work despite those constraints—and, it must be added, despite limited interest among most reviewers and book buyers outside the claustrophobic world of Disney fans. It's no wonder that so many official Disney books simply recycle the same facts and illustrations that previous authors have used, and it's a cause for rejoicing when a few authors break free of those constraints,discovering and publishing neglected artwork and performing original research that refreshes our awareness of what we may have thought was overly familiar. It's wonderful to be reminded of just how extraordinary Walt Disney's studio was in its heyday. Three new (or in one case, recent) books deserve extended reviews that I can't give them yet—I've been spending too much time doing other things, like preparing interviews for publication here—but that's no reason not to buy them as quickly as you can. Thanks to their authors' credentials and the richness of their illustrations, all these books are self-recommending. 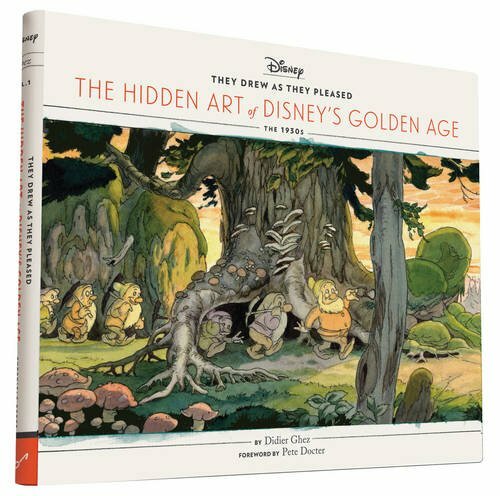 At the top of my list is Didier Ghez's They Drew as They Pleased: The Hidden Art of Disney's Golden Age (Chronicle), a gorgeous book that reproduces hundreds of pieces of concept art from the 1930s by Albert Hurter, Gustaf Tenggren, Ferdinand Horvath, and Bianca Majolie. I've done no more yet than skim the text, but Didier's record for comprehensiveness and accuracy, established beyond cavil in Disney's Grand Tour (2014), his account of Walt and Roy's 1935 visit to Europe, appears to be completely intact. The interesting question is how his new book measures up against Canemaker's Before the Animation Begins (1996), which covers much of the same ground, and I can't answer that with any confidence yet. My best guess is that anyone with a serious interest in the Disney studio's history will want both books, and will be very satisfied with both purchases. My one reservation, which I've voiced about some of Canemaker's books, is that I'm not sure a biographical approach is always the most productive when dealing with a collaborative medium like animation. But I'm open to persuasion, and looking forward to spending much more time with Didier's book than I've been able to so far. J.B. Kaufman's Pinocchio: The Making of the Disney Epic (Walt Disney Family Foundation) is devoted not to a group of artists, but to a single film, as with his The Fairest One of All: The Making of Walt Disney's Snow White and the Seven Dwarfs (2012). Like the earlier book, Pinocchio is richly illustrated, but considering how much artwork from Pinocchio has already seen print, the greatest weight of interest falls necessarily on the text. I read the book in manuscript a few years ago and found very little to complain about. 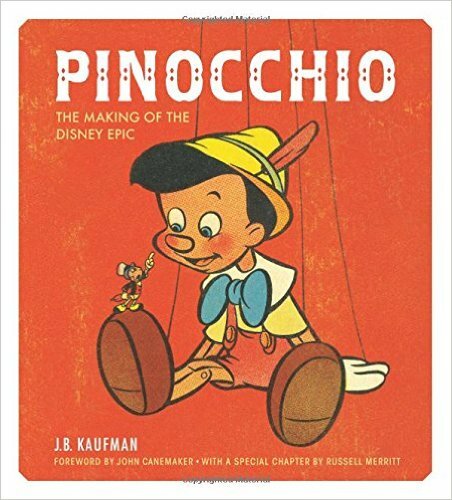 In Pinocchio, as always, Kaufman is a researcher non pareil, piecing together the story of the film's making from countless bits of information in the Walt Disney Archives, Disney's Animation Research Library, and many other sources. A more complete and accurate account of Pinocchio's production is impossible to imagine. My reservations go less to Kaufman's performance than to the film itself. As I've argued in my own Hollywood Cartoons: American Animation in Its Golden Age, Pinocchio is problematic in a number of crucial areas, especially in its handling of the title character. Unless Kaufman revised his manuscript after I read it—and I don't think he made any significant changes—he didn't address any of my concerns. That's his author's prerogative, and the book remains excellent on its own terms. I can't help but regret, though, that it was published not by an "outside" company, like Chronicle Books, the publisher of Didier Ghez's book, but by the publishing arm of the Walt Disney Family Foundation. That affiliation has probably ruled out very much serious attention outside the Disney biosphere. Now we need a full-scale examination of Fantasia, preferably by John Canemaker. That's not to say Kaufman wouldn't do an excellent job, only that Canemaker's devotion to the film, and his own strengths as a researcher and author, make him the ideal choice to write a Fantasia book that would supplant John Culhane's unsatisfactory effort from 1988. 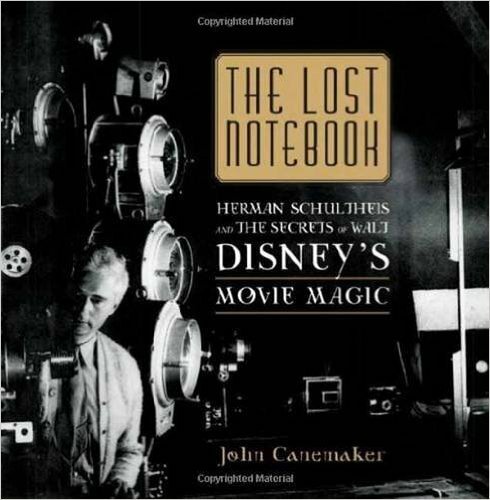 In the meantime, I still need to finish reading Canemaker's most recent and possibly most important book, The Lost Notebook: Herman Schultheis and the Secrets of Walt Disney's Movie Magic (2014). With any luck, I'll have all three of these important new books read and reviewed within the next few months. Not that I think that anyone is waiting desperately to learn what I think of them. Anyone besides me, that is. I often don't know what I think about a book or a film until I've reduced my thoughts to words, and that will certainly be the case here. I'm looking forward to reading my own reviews. I met Jay Ward twice, both times at the Ward studio on Sunset Boulevard. Both times, I was there to interview Lew Keller, and the studio was, as best I recall, empty except for Jay and Lew. (Jay's wife Billie was still running Dudley Do-Right's Emporium, which sold licensed merchandise with the Ward characters next door.) The first meeting was in December 1986, and I remember Jay coming into the room where Lew and I were sitting, seeing that an interview was in progress, and beating a very hasty retreat. He was highly allergic to interviews, even, I suppose, other people's. That interview with Lew Keller, about his studio work before he went with Ward, was a disaster. Electrical interference of some kind filled most of the tape. I got together with Lew again two and a half years later, in 1989, again at the Ward studio, although we adjourned to a coffee shop across the street to reduce the risk of electrical problems. I spoke with Jay again, this time making a point of saying to him, as I stuck my head in his office, that I'd seen Lloyd Turner in Oregon just a couple of weeks before. This time, Jay smiled and didn't bolt from his desk, and we talked briefly about Turner, whom we both liked very much, before I returned to Lew. 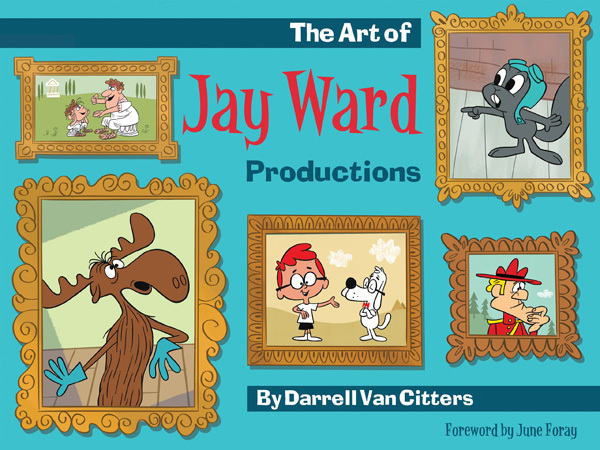 I thought about those visits to the Ward studio when I first saw Darrell Van Citters' beautiful book, The Art of Jay Ward Productions (Oxberry Press, 2013). That book is filled with model sheets and other drawings that I'm sure I saw as yellowed photocopies on the studio's walls. As Darrell says, those drawings are greatly superior to what wound up on the screen, after the cartoons were animated in Mexico. I think I'd say that thanks to those model sheets and such, Darrell's book is not just more pleasing to look at than the cartoons, but funnier, too. I loved the Ward cartoons when both they and I were new, decades ago, but when I've seen them again more recently, I've been disappointed. Probably they're a little disappointed in me, too. If you haven't shared my disappointment, you should seek out this excellent book, and, while you're at it, Keith Scott's classic history of the Ward studio, The Moose That Roared (2001). I haven't lined up the two books for close comparison of their accounts of Ward history—I'm just not that interested in the Ward cartoons—but I'm pretty sure they're complementary. Anyone who enjoys the Ward cartoons as much as I used to should probably have both. From Donald Benson: I think the cheap, obviously rushed animation on Bullwinkle & Co. was part of the appeal. The scripts were usually fast and witty, and often sounded like inspired improvisations. The animation supported that by LOOKING like a hasty improvisation. Compare with "Freakazoid", which tried for the same mood with full-looking animation and orchestral scoring for every gag. Sometimes the obvious expense supported a gag, but more often it called attention to how much effort and production was behind every wisecrack. I've never wanted to beg for favorable reviews on amazon.com, but saddled as I am with publishers who recoil at the thought of promoting or selling my books, I don't think I have much choice. (As one example, The Animated Man: A Life of Walt Disney has been "temporarily out of stock" for weeks, coincidentally since just about the time I alerted my editor that I would make a cameo appearance on PBS's "Walt Disney.") So, if you've enjoyed Funnybooks or The Animated Man or Hollywood Cartoons, and you feel the urge to tell the world about it through a comment on amazon, please do so. I would truly appreciate it. That's all for the next few weeks. See you in early October, probably. 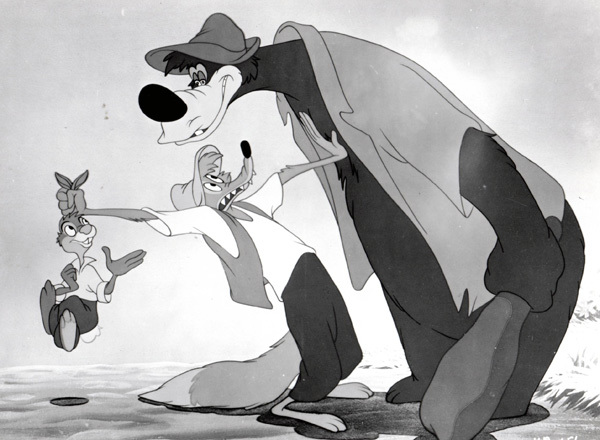 A Bill Peet story sketch for one of the animated sequences in Song of the South (1946) directed by Wilfred Jackson. The second of my two interviews with the great Disney cartoon director is at this link. From Don Peri: Thanks, Mike, for continuing your wonderful conversation with Wilfred Jackson, who I now learn had yet another nickname: “Bill”! Wilfred was such a great source of information. Not only amazing recall, but he analyzed his experiences. I have interviewed a number of people over the years and not that many thought through their work and their relationships like Jaxon did. What a treasure! Thanks for sharing this important interview with us. From Pete Docter: Another excellent interview. Once again you covered important subjects not discussed anywhere else, such as the director's collaboration with layout and musicians. Thank goodness you had the foresight to ask someone as exacting as Jaxon before this knowledge was forever lost. Here's a link to a review I think you can trust. Thank you, G. Michael Dobbs, for giving me back the four hours of my life I might otherwise have spent watching this blighted documentary. Ken Burns, where were you when we needed you? From Charles Kenny: The current status of Walt and his relationship with the company that bears his name has become extremely twisted and contorted. Plenty of primary sources from the time when he was alive will almost always comment on how the organisation effectively functioned as an extension of the man himself. It embodied his beliefs, his dreams, and his drive to succeed. Walt Disney Productions (as it was called then) was headed up by a true leader with all the positive and negative traits that tend to come along with that. The culture of the organisation carried on much the same from his death until the 1980s, when Michael Eisner and co. came on board. It's noted in a few places that Eisner began to supplant Walt's traditional place alongside Mickey mouse in publicity materials and such. This marked the moment that Walt's role transitioned from that of a [departed] leader, to that of a mere figurehead. Fast forward to today, and the relevance of Walt to the Walt Disney Company is minimal at best. His ideas, beliefs, and viewpoints are at such odds with much of what the company produces and owns that it would be rather embarrassing for the current management if a completely accurate portrait of the man was presented. Today, the image of Walt Disney conforms to what the organisation believes it should be, and not the other way around. He is a convenient character to be trotted out at opportune times, and a deity of sorts, to whom but lip service is given. The PBS documentary will not alter this state of affairs. Although produced by a public entity, it nonetheless must capture eyeballs. A straightforward documentary that adheres closely to the truth isn't"'edgy" enough, so it is"sexed up" to draw in an audience. Even then, the vapid and instantaneous nature of contemporary media consumption will ensure that this documentary is forgotten by the majority almost as soon as it has finished airing. It serves no higher purpose than to burnish the reputation of the producers and the Walt Disney Company as it exists today. From Donald Benson [before seeing the PBS show]: Any time a venture grows from the vision of a powerful founder or founders, there's going to be that moment when it outgrows the ability of one man to truly control it. Late in Disney's lifetime, you got the conflicting images of Walt the folksy but obsessive micromanager and Mr. Disney, a distant Citizen Kane with a Colonel Sanders public face. You saw less and less of Walt Disney's hand in the deliberately bland live action and the increasingly rare animation. Some of this was a result of his conscious decision to focus on his Florida project, but even without that the company had grown beyond his ability to lay hands on everything. And even if he could, would he have been able to understand and adapt to a changing audience? Hollywood was and is crowded with brilliant creatives who outlasted their moment, lapsing into self-parody or bitter irrelevance as younger people run with their innovations (Would Walt have produced Star Wars, given the chance? One likes to think he would, but it's doubtful.). It's worth noting that Michael Eisner was celebrated as the savior of Disney, not just by corporate PR but by the media and general public. If not a creative himself he seemed to "get" creatives and the company's legacy; and he had a sane counterpart in Frank Wells. Suddenly there were hit movies, animated blockbusters, and lavish expansions at the theme parks. But he too became a victim of his own success: When one of Hollywood's smaller (albeit famous) entities grew big enough to buy out ABC, Eisner the enthusiastic but pushy kid became Eisner the 2,000-pound bully. Moving from million-dollar deals to billion-dollar deals, with an adoring business press most of the way, will do that to a person. Disney is a very unusual case. Even in an age of cynicism and diehard What-Would-Walt-Do critics, they actually monetized corporate goodwill into D23. But here in Silicon Valley we have a sort of analog in Hewlett-Packard. The founders, classic old-school inventors / entrepreneurs, were revered for "The HP Way," a strong corporate philosophy of virtuous practices. To this day, successive leaders of a much larger and often troubled giant are judged against that idealistic document. It comes up even now for candidate Carly Fiorina, a one-time HP CEO. If it's a hatchet job, it's in hatcheting out chunks of Disney's life in the service of a stock Hollywood narrative: Ambitious young man, early setbacks, mad dream/gamble succeeds, success is bittersweet, and finally a sort of comeback/rebirth. The deletions and shortcuts are maddening. Walt Disney is introduced as a young soldier returning from WWI, not the underaged kid who fibbed his was into the ambulance corps, survived influenza, and ended up in France after the shooting stopped. "El Groupo" was simply "a working vacation" to get away from the strike. We're told his fortunes were riding on "Bambi" and "Dumbo", but the latter film is never mentioned again (except later as one of his important early films). After highlighting Disneyland's disastrous opening day, they imply everything was peachy immediately afterwards and show clips reflecting the massive additions Disney made in the decade that followed. Amusingly, Mary Poppins is seen as Walt Disney rewriting history about his father—exactly as Saving Mister Banks positions it as P.T. Travers rewriting history about her father. I found myself thinking of the "Chaplin" biopic, highly frustrating despite an amazing performance by young Robert Downey Jr. and impressive work throughout. Chaplin's long and complicated life was likewise stripped down: major people and events in his life were just sort of name checked; his lifelong fixation with very young women was "explained" by a single scene of the boy Chaplin watching a gorgeous young chorus girl; and J. Edgar Hoover became a lifelong nemesis to conveniently personify all his legal and political troubles. I'm sure everyone who visits this site is aware by now that PBS' American Experience will devote four hours to a biography of Walt Disney, spread across two nights, September 14 and 15. I was interviewed for the show, which is titled simply "Walt Disney," early last year in Boston. I haven't seen "Walt Disney," but the producers say that I'll be in the September 14 installment—very briefly, I gather, from what I've been told by a person who has seen the whole thing. I was unwell the morning I was interviewed, thanks to something I ate the previous evening, and if the recorded interview betrayed my unease, that would have been reason enough to minimize my contribution. Other considerations may also have been at work. The promotional clips that have turned up on Facebook and American Experience's website, totaling perhaps twenty minutes so far—that is, a fair sampling of the whole show, especially since the idea must have been to make it seem as attractive as possible—have been disappointing, to say the least. My fellow interviewees seem to have included a surfeit of fatuous academics, including at least one Marxist crank. It was understandably hard, almost fifty years after Walt's death, to round up a few people who knew him personally, but, rather than rely on archival footage of important Disney employees and friends, the show offers new interviews not just with reliable sources like Floyd Norman and Richard Sherman but also with the barely marginal, like Ruthie Tompson and Bob Givens. To judge from the clips, "Walt Disney" will also serve up more than enough Neal Gabler and his factitious view that Walt was a strange man with "darkness" at his core. Gabler is a skilled TV performer, chipper as a chipmunk—he has put to good use his experience as the liberal punching bag on a Fox News show—and it's no wonder that the American Experience people found him an attractive interview subject. It's too bad that so much of what he writes and says is simply wrong. I don't remember in any detail what I said in my own interview, but I can't imagine that it fit very snugly with what people like Gabler had to say. I'm sure, for one thing, that I rejected the popular view that Walt's father, Elias, was a brutal ogre. That may be one big reason I wound up on the cutting-room floor. No doubt I departed from orthodoxy in other ways. I'll record both installments of "Walt Disney," but as it happens I have conflicts that will prevent me from watching "live." Phyllis and I will leave for our old home town of Alexandria, Virginia, on September 16, and we won't be home for much of the following few weeks, so I have no idea when I'll see "Walt Disney," or if I'll see the show at all. I've watched myself on TV before, so that's no lure—quite the opposite—and certainly I can't get excited about seeing more of Gabler. Not watching the show is more attractive the more I think about it. The American Experience website speaks of gaining "unprecedented access to the Disney archives," and the show's executive producer, Mark Samels, says that PBS insisted on, and got, complete editorial control. I thought all that sounded familiar, and sure enough, when I pulled Gabler's Walt Disney off the shelf, I found claims of exactly the same sort. "Gabler is the first writer to be given complete access to the Disney archives," the dust jacket announces, and in his acknowledgments Gabler thanks the Disney executive Howard Green for sparing him from having "to submit the manuscript to the studio for approval. ... I did not seek nor did I receive a company imprimatur." In both cases, as we know for certain with Gabler's book and as seems likely with the PBS show, this hands-off posture effectively endorsed a badly distorted portrait of Walt. That's not to say that either Gabler or PBS should have been locked out of those fabled Disney archives, only that other independent writers and filmmakers should have been allowed in, as I was back in the 1990s. There's something odd about a situation in which people like Gabler and the PBS producers—that is, people with an entirely predictable skepticism about Walt Disney and his creations—are welcomed into the company's treasure rooms, while people who have written sympathetically and accurately about Walt are regarded with suspicion and hostility, and made to pay handsomely for what little help they get. One might almost think that the current Disney management is happy to see Walt denigrated by respectable sources like PBS, because such criticism discourages invidious comparisons with his successors. A sad thought, but draw your own conclusions. I grew up with Bob Broughton and his family as family friends, and met Ruthie through Bob. At Bob's memorial service, Diane Disney Miller spoke, to thank Bob for defending Walt against that hatchet job Gabler put together. Your conclusion is probably correct: these folks are trying to move Disney into the shadows so they can continue to manipulate his legacy to their avaricious ends. Bob Broughton used to lament the types of movies being put out by the studio under Eisner, and he'd be even more upset with the new films, I'm sure. And the conversion of Disneyland into LucasLand is certainly not what most visitors want. So onward, and keep it up. Nine years ago, I posted ten pages of drafts—the scene-by-scene records of who animated what—for cartoon portions of the Disney feature Song of the South, with a promise to post more later. I wondered at the time how much interest there was in such things, although my own interest has always been high. Back in the 1990s, I waded through many hundreds of draft pages at the Disney Archives, before outside researchers were banned, and I've always found drafts highly illuminating, not just about who animated what but about how cartoon producers and directors marshaled their talent. My skepticism about other people's level of interest in drafts seemed to be justified by the silence that greeted my publication of the Song of the South drafts, but in the last few years I've had a trickle of inquiries about when I'd post more of the drafts, and other people have posted other drafts on their own websites, attracting at least a modest response. 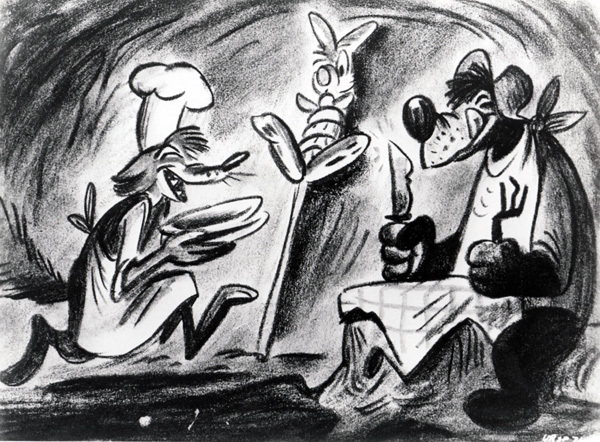 Hans Perk has been far and away the most prolific, posting many Disney drafts, and Devon Baxter, at Jerry Beck's Cartoon Research site, has been posting drafts for short cartoons from many differerent studios and directors, most recently—and most intriguingly—the draft for The Night Watchman, the first cartoon Chuck Jones directed at the Schlesinger studio. So, I'm now posting the drafts for the remainder of Song of the South's cartoon sequences: the Tar Baby combination sequence, the Tar Baby sequence proper, the Laughing Place sequence, and the combination sequence that ends the film. In each case I've posted all the draft pages for a sequence on a single Web page, with links from individual pages to larger versions. The drafts I posted in 2006 for the opening "Running Away" combination sequence are still up; the quickest way to get to them is to go to the archived page for my September 2006 "What's New" posts and click on the appropriate links. What I really should do now is pull all these drafts together, in a more attractive presentation, and I'll try to do that, I hope in less time than nine years. From Thad Komorowski: Thanks for posting the rest of the drafts. Really illuminating material. I was expecting the scenes to be more fragmented by character, as was the Disney feature practice, but it really does look like the scenes were cast more like a short, and a non-Disney short at that. As in, "Here's your 30 feet for the week." I guess that (and the story material) sacrificed the potential for the animated portions of Song of the South to be in the top echelon of "serious" Disney feature acting, and relegated it to a status equal to top-tier Freleng. But when the cartoons are that funny, who cares? I've known for years (I forget my source, but it was someone who'd read the draft) that Eric Larson animated B'rer Fox's "whistling 'HOWDY' song and doing shuffle step," and it's nice to have the confirmation on public record. Nice, subtle acting there, to a beat, yet. Not a simple feat. From Steven Hartley: Just thought I'd comment and to thank you for your recent posting of the remaining Song of the South sequences. To me, the characters are some of the most compelling in Disney history! What particularly fascinated me was, compared to many feature drafts, is how dominant the directing animators are as far as their animation goes, and their roles as supervisors are very revealing. Analysing the drafts on this era, it's intriguing to see how much continuity Milt Kahl or Marc Davis got for their sequences, which became more common in the latter features like Sword in the Stone and Jungle Book, when the animation department was significantly smaller. Many of the "character animators" have scenes are shared with their supervisors, especially in scenes where only one character appears. It appears the directing animators left the "character animators" very little to do on their own, as far as footage goes.